Born in Sandwich, Ill., Rufus Bernhard von KleinSmid (1875-1964) began his career in school administration in 1897 as the Illinois superintendent of public schools. He earned his A.B. and M.A. degrees from Northwestern University and was a professor of education and psychology at DePauw University from 1905 to 1914. During his last few years at DePauw, he also served as state psychologist, founding the American Association of Criminal Psychology and establishing laboratories for research in criminal psychology in the state’s penal institutions. 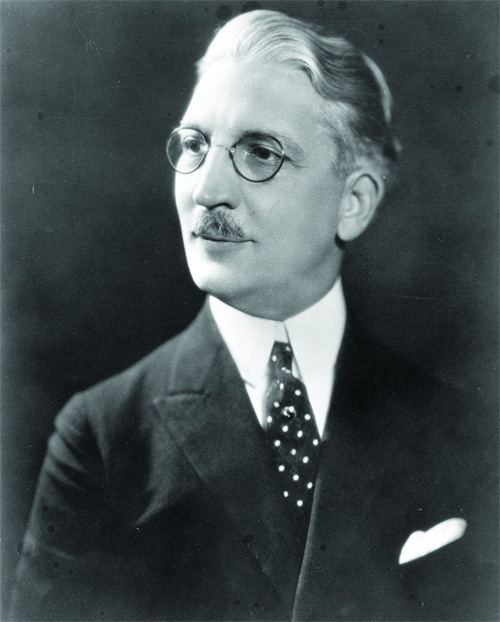 Upon accepting the position as USC’s fifth president in 1921, von KleinSmid found a growing but undeniably modest institution composed of eight schools and colleges and enrolling 5,635 students, with a campus encompassing a mere eight buildings. Within six months of his inauguration, the new president announced plans for a $10 million capital campaign to raise funds for new buildings as well as endowment. Although the campaign ultimately fell short of its goal, it did fund the construction of several much-needed facilities. In addition to raising money, von KleinSmid sought to unify and restructure the various academic units of the university, some of which were affiliated with USC but governed by their own boards. During his first few years in office, the schools of pharmacy, oratory, music and law were fully integrated into the university. To strengthen USC’s ties to the community, he also created the Extension Division in 1922, which offered afternoon and evening classes in locations ranging from Glendale to San Diego. The first Ph.D. degree conferred in Southern California was given at USC in 1923. In 1924, von KleinSmid established the country’s first School of International Relations and its annual Institute of World Affairs. In collaboration with the Academy of Motion Picture Arts and Sciences, he created the country’s first school of cinema at USC in 1929. In 1928, as USC approached the 50th anniversary of its founding, USC’s student body numbered more than 15,000 and represented 34 separate denominations and religions. Von KleinSmid — USC’s first layman president — launched another $10 million campaign and, to enable the university to receive contributions under California law, convinced the Board of Trustees to secularize the university and amend the articles of incorporation so that the board would be self-perpetuating. Although the university had raised nearly $2.3 million toward its goal within a year of this decision, the stock market crash effectively ended the campaign. Although the Great Depression took a toll on the university, USC continued to grow. In fact, 1930 was a landmark year for USC. Four buildings — Mudd Memorial Hall of Philosophy, Bridge Memorial Hall, the Physical Education Building and Science Hall (today’s Zumberge Hall) — were dedicated, as was Tommy Trojan. The student body had become cosmopolitan, and USC was ranked third in the United States in international enrollment. The magnificent new Edward L. Doheny Memorial Library opened its doors on the first day of school in fall 1932. USC made progress in distance learning when the “University of the Air” debuted in 1934, and four years later, USC became the only university in the country to write and produce television programs. The university’s research and academic enterprise expanded, and USC gained an endowed research foundation when Capt. G. Allan Hancock, president of the Board of Trustees, created the Allan Hancock Foundation for Scientific Research. The Hancock Foundation Building was completed in 1940. With the advent of World War II, however, major changes were in store. Male students went off to war, and the government instituted military training programs on campus. Army barracks were constructed, and the armed forces took over certain university buildings. The curriculum was accelerated and adjusted to a wartime emphasis on fields such as international relations, history, geography, languages and aerospace science. USC also became a center for war-related research, housing a high-altitude chamber and the largest experimental blackout centrifuge in the country. After the war, enrollment swelled with the influx of veterans enrolling under the G.I. Bill. Before Pearl Harbor, USC had enrolled an average of 6,000 full-time day students. Less than five months after the war ended, the student body consisted of 8,300 daytime students and 3,500 evening students. The following year, there were 10,500 veterans among the 15,000 day students. The numbers continued to skyrocket, reaching a peak in 1947-48, when USC’s combined daytime and evening enrollment reached 24,000, mostly former servicemen. Von KleinSmid, then 71 years old, stepped down from the presidency in 1947 and was named chancellor for life. His presidency left a remarkable legacy: a university transformed from a modest local denominational institution with a scattering of schools and facilities to a consolidated secular institution with 24 schools and colleges, 16 buildings, and national accreditation and standing. Rufus Bernhard von KleinSmid, affectionately known as “Dr. Von,” becomes USC’s fifth president. USC dental student Milo Sweet composes the music for USC’s official fight song, “Fight On,” as an entry in a Trojan Spirit contest. The first attempt at a sequential card stunt for a Trojan football crowd is made under the direction of Lindley Bothwell in the stands on USC’s Bovard Field. The first Rose Bowl game is played at the present Pasadena location, with USC winning against Penn State 14–3. The USC Trojans play in the first varsity football game ever held at the Los Angeles Memorial Coliseum, beating Pomona College 23–7. Al Wesson’s “All Hail,” written for the finale of a student show, becomes USC’s second alma mater. USC establishes the country’s first school of international relations. The Trojan Marching Band plays under the baton of John Philip Sousa. USC holds its first formal observance of homecoming. Building on classes initiated in 1906, USC forms a College of Engineering. USC confers its first Ph.D. degree to David Welty Lefever in the School of Education. The USC School of Public Administration opens, the second of its kind in the United States. USC’s Department of Cinema is founded by Cecil B. DeMille as the country’s first filmmaking program; the first course, “Introduction to Photoplay,” features faculty members such as D. W. Griffith, Darryl Zanuck and Douglas Fairbanks Sr.
A bronze statue of a Trojan soldier, now fondly known as Tommy Trojan, is unveiled in celebration of USC’s 50th anniversary. As models for Tommy’s face and body, sculptor Roger Nobel Burnham enlists several USC football players, including Russ Saunders, Ernie Pinckert, Henry Becker and John Ward. With more than 700 foreign students (10 percent of the student body), USC ranks third in the United States in international enrollment. Four major buildings — Mudd Memorial Hall of Philosophy, Bridge Hall, Physical Education, and Science Hall (today’s Zumberge Hall) — are dedicated as part of USC’s semicentennial celebration. USC’s Edward L. Doheny Jr. Memorial Library opens. Before a large audience in Bovard Auditorium, USC hosts the debate team from Texas’s all-black Wiley College to address the question of whether the nations of the world should agree to prevent the international shipment of arms and munitions. President Franklin Delano Roosevelt visits the University Park campus and receives an honorary doctor of laws degree. Gil Kuhn becomes the first Trojan football player to be drafted into the pros, joining the Brooklyn Dodgers (at the time, a National Football League team). USC’s Elizabeth Holmes Fisher Art Gallery (now known as the USC Fisher Museum of Art) opens. Six pranksters from USC’s Sigma Phi Epsilon fraternity abscond with UCLA’s victory bell after the opening game of the football season. This ultimately results in the tradition of passing the bell between the rival schools. USC’s Department of Occupational Therapy opens as one of the first programs of its kind in the country. USC installs a human centrifuge, used to study the conditions leading to blackout. USC’s Departments of Biokinesiology and Physical Therapy are founded. Playwright William C. DeMille (Cecil’s brother) establishes the USC Department of Drama. Rescued from Santa Monica beach by a Trojan Knight, a feisty stray dog nicknamed George Tirebiter is elected as USC’s student body mascot. KUSC goes on the air. Dr. Von passes the presidency of USC to Fred D. Fagg Jr., who, as sixth president, proposes university expansion. Enrollment jumps 8,500 to a staggering 24,000 in just two years.